They say the fountain in London's Trafalgar Square turned the color of blood on Armistice Day l ast weekend, as Britons in their hundreds of thousands trudged out in the November gloom to comm emorate the end of the First World War, and lament the dead in all the wars thereafter. But the turning of the water was no miracle, no divine judgment on the leader whose fateful partnership with George W. Bush is producing â€“ week after week, month after month, year after year â€“ fresh cause for future mourning. The color came from the thousands of fake poppies tossed into the fountain in what The Observer called "a spontaneous act of remembrance": an offering of the ubiquitous charity emblems worn by most of the population in the week leading up to the memorials. 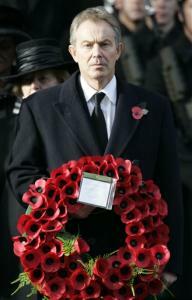 In any case, Tony Blair never saw the vision of blood in the Square; he was in Hyde Park, with the Queen and other worthies, conducting formal ceremonies where no free action or unscripted word from the public was allowed to intrude. These offices of the dead were a fitting end to a week which saw Blair and his ministers launch a massive new fearmongering campaign, promising a "generation" of terror, war and tyrannical security measures in a "long and deep struggle" against his own nation's Muslim minority. The American media establishment has launched a major offensive against the option of withdrawing U.S. troops from Iraq. In the latest media assault, right-wing outfits like Fox News and the Wall Street Journal editorial page are secondary. The heaviest firepower is now coming from the most valuable square inches of media real estate in the USA -- the front page of the New York Times. Until the notorious federal penitentiary was closed in 1963, Alcatraz Island was a place most folks tried to leave.On November 20, 1969, the island's image underwent a rather drastic makeover. That was the day thousands of American Indians refused to leave thus beginning an occupation that would last until June 11, 1971. The 1973 armed occupation of Wounded Knee along with the siege at the Pine Ridge Reservation one year later (which led directly to the incarceration of the still imprisoned Leonard Peltier) are etched deeper in the public consciousness in terms of recent Indian history, but is was the Alcatraz Island occupation that ushered in a brave new era of Native American activism. Baghdadâ€™s kangaroo court has issued a verdict that virtually guarantees that Saddam Hussein will launch his journey into the hereafter from the platform of a gallows. Convicted of â€œrevenge killings of 148 people, deportation of 400, and razing of orchards,â€ (1), and still facing a charge of genocide that resulted in the deaths of 180,000 Kurds, Hussein is undoubtedly a malevolent individual. Forget all the talk about civility and compromise. It's clear that President Bush and his aiders and abettors in the Congress are going to do their damndest to cover their tracks over the next few weeks, using their "lame duck" majorities in House and Senate to pass legislation, while they still can, protecting them as much as possible from future investigation and retaliation. Bush clearly wants a bill granting him retroactive immunity for his crime of violating the Foreign Intelligence Surveillance Act--probably the surest path to his impeachment in a growing list of some dozen crimes against law and Constitution. He may push other actions insulating himself and his cohorts from future prosecution too, as he already did just before the election in ramming through a bill immunizing him against prosecution for authorizing torture. While the Democrats won't have a majority in either branch of Congress until early January, when newly elected Democrats are sworn in and replace some 30 Republican members of the House and six members of the Senate, they have plenty of members already in place to perform a blocking action--particularly in the Senate, where the Democrats can fillibuster to death any bill they want by just keeping 40 of their 45 caucus members together. There was no shortage of opportunists present as they broke ground the other day for the $100 million Martin Luther King memorial in Washington, DC. Charlatans from Oprah to Hilfiger lined up in the hope a little of Dr. King's integrity might rub off on them. But the most out of place speaker was, of course, President George W. Bush, who told the crowd, "our journey to justice is not complete. There are still people in our society who hurt, neighborhoods that are too poor ... there's still prejudice that holds citizens back." That whirring noise heard in the background...well, you know the rest. As Dubya spoke about "the promise of America," I had to wonder what he'd think of the Dr. King who said: "A nation that continues year after year to spend more money on military defense than on programs of social uplift is approaching spiritual doom ... Our scientific power has outrun our spiritual power. We have guided missiles and misguided men." Surely, today's America would have an orange jumpsuit all ready for the MLK that believed, "The question is not whether we will be extremists, but what kind of extremists we will be" and "When you are right, you cannot be too radical." So the Democrats Won â€“ What About the American Empire? The Democratic Party prevailed in the Nov. 7 midterm elections. "Weâ€™ve just moved out of a straightjacket," a friend commented. Many celebrated. But after that, lets think carefully about the larger picture of the current state of the American Empire. Signs exists that its power is declining. Little in the post-election coverage has considered this issue. "Defeat is not an option," Bush again insisted in his press conference the day after his resounding defeat, referring to the Iraq War. Yet it is precisely defeat in Iraq that stares him in the face, as even many American generals have admitted. This defeat is not just in Iraq, not just of the Republican Party, not just of Bush, and not just on Nov. 7. It plunges deeper into the Empire itself. On Nov. 8 Bush once again attempted to mount his Victory horse, though with a changed tone of less arrogance.